Successful organizations make data-based decisions. However, obtaining heritage industry data is difficult. Heritage Business International provides our clients with industry data, market intelligence, strategic analyses, economic contexts and forward looking forecasts to allow for the quantitative, strategic decision making that make heritage organizations smart, nimble and competitive. 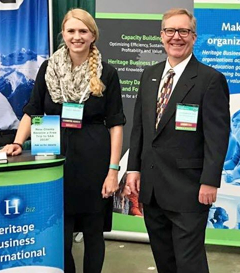 Heritage Business International helps heritage organizations achieve their research, preservation, and education goals in the global marketplace by strengthening business functions and returning shareholder value. We provide capacity-building to make your organization more efficient, sustainable and profitable, as well as business education training for heritage professionals. We also provide industry data, market intelligence, strategic analysis, economic contexts, and forward-looking forecasts to allow for quantitative strategic decision making and the development and execution of business strategies for international growth. Our premise is simple: the stronger your business, the greater your chance of achieving your heritage goals. We bring heritage-specific business expertise to compliance consulting firms, tourism companies, architectural firms, heritage attractions, heritage media, as well as museums, archives and repositories. You can be more profitable, return shareholder value and achieve your heritage goals.